Pancake Tuesday was day of mixed emotions for an Irish child in the 80s. On the one hand we got to devour seemingly endless quantities of scrumptious pancakes. On the other hand it marked the beginning of a period drudgery and abstinence – being dragged out of bed for early mass and being presented with porridge for breakfast instead of the usual corn flakes. The masses did me no harm, but I was left with a very lasting dislike of porridge, which I viewed as a tasteless commodity associated with discipline and deprivation. It took me until my early twenties, when I started working at the 5-star Ashford Castle Hotel, where porridge was made with whole milk (no water) and served with double-cream and brown sugar, to rekindle my liking for porridge. I’d always thought of Pancake Tuesday as something that was uniquely Irish – I never saw it being celebrated on TV shows from overseas and there was no internet in those days. It turns out that Pancake Tuesday, or a version of it, is celebrated in very many countries including, to my delight, Lithuania. Pancake Tuesday in Lithuania is a completely different affair which could be likened more closely to our celebration of Halloween. The day is called “Užgavėnės” (oosh-gav-ennis) which literally means “before Lent”. However, the celebration predates Christianity by quite some time, instead having its origins in Pagan traditions. At its core is the celebration of the changing of the seasons – chasing Winter away and welcoming Spring. A major element of the festivities is a staged battle between Winter (personified by a charter called “Porky” or “Fatso” ) and Spring (personified by a thin character called the “Hempen Man”). Spring is always allowed to win. Later in the day and effigy of Winter is burned over a bonfire as a final farewell to the cold season. During the day people overindulge on various foods, including pancakes. Custom dictates that you must eat at least 12 times during the day to sate the appetite before the long Lenten fast. 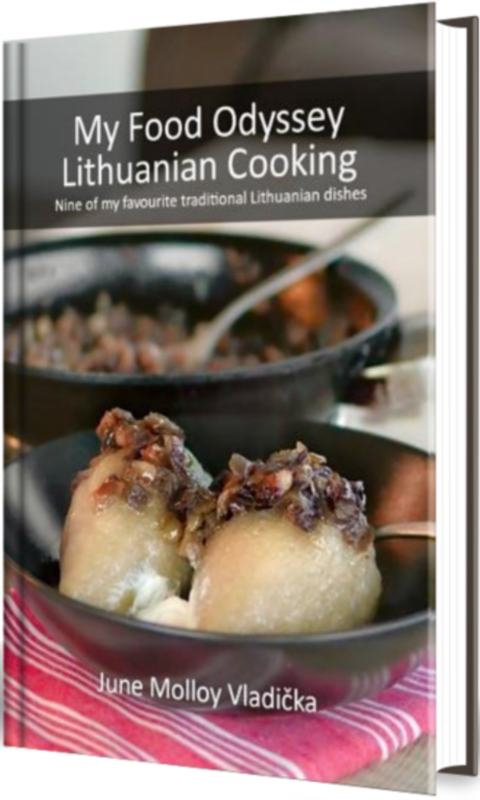 A large meal is prepared which must be consumed in its entirety before nightfall – having leftovers on Užgavėnės is considered bad luck. This is in contrast to the Christmas Eve celebration, where leftovers are deliberately left on the table for the spirits of family members who have passed on. If you visit a house on Užgavėnės you must sample at least one bite of every dish that’s presented, regardless of how much you have already eaten. Užgavėnės is a day of mirth and merriment. Children in costume (witches, devils and such like) go from house to house, singing songs and dancing in the hopes of receiving some pancakes. Adults, too, don costumes and join in the merriment, which can continue well into the night, until the first rooster’s crow indicates the start of Lent. Unlike Ireland (certainly, back in the 80s), Lithuanians eat pancakes all year round. They are made from a wide variety of ingredients including wheat flour, buckwheat flour and potatoes. They have various toppings including curd cheese (quark), runny jam and meat sauces. Maple syrup, lemon juice and sugar do not feature! A few years back my husband and I started our own tradition of having pancakes for breakfast every Saturday morning. To make them a bit more wholesome I would grind a handful of porridge oats and add to the batter in place of some of the flour. Our toppings of choice were Nutella with sliced banana or melted cheddar cheese with maple syrup. As a result of such regular repetition over an extended period I can now make pancakes with my eyes closed, consistently turning out thin and crisp crêpe-like beauties. This recipe makes pancakes that are thin and crispy yet substantial enough to hold a filling. Rapeseed (canola) oil or sunflower oil, for frying. *I prefer to use whole milk in my pancakes. Reduced-fat milk (2.5%) also works well. However, using milk with a lower fat content will alter the consistency of the batter resulting in a less crispy pancake. Place all the ingredients in a mixing bowl and whisk using a metal or electric whisk until the batter is smooth and free of lumps. You can also do this in a blender or food processor. I use the beaker that came with my stick-blender, using the stick-blender itself to quickly create a smooth batter. The batter should be roughly the consistency of double (whipping) cream. The size of your eggs can impact the consistency slightly. If your batter seems a little thick then add some extra milk, 1 tablespoon at a time, until it reaches the consistency of double cream. Transfer the batter to a pouring jug or beaker. Purists would dictate that the batter should now rest for at least one hour before use. I rarely do this and my pancakes are always delicious. However, if you have the time to spare, it certainly does no harm. Heat a cast-iron or heavy-bottomed frying pan over a high heat. Add about 1 tablespoon of oil to the pan. When the oil begins to smoke, lift the pan off the heat and pour some of the batter into the centre of the pan, rotating the pan as you pour to distribute the batter. Use just enough batter to cover the bottom of the pan in a thin, even layer. Put the pan back on the heat and cook until the top has set and the edges start to curl away from the pan – about 1 minute. Using a spatula, flip the pancake and cook on the other side for about 45 seconds. Once the pancakes are set on each side you can continue to cook them, flipping every 30 seconds or so, until they reach your desired level of doneness. I like mine just starting to turn golden, with crisp edges but with the centre still soft enough to roll without cracking. I achieve this using 1 minute + 45 seconds as indicated above. However, different cookers and pans can vary the results considerably, so you will need a little patience cooking the first few pancakes until you find what works for you. Take a note of the timing for subsequent pancakes. Turn the pancake out onto a plate and continue cooking the next pancake. In our house pancakes get devoured as soon as they are cooked, while they are still hot and crispy. However, if you prefer you can cook the entire batch, stacking the pancakes on a plate, and either serve cold or reheat each pancake for a few seconds on a hot pan before serving. Options for topping pancakes are endless – let your imagination go wild! Here are a few suggestions to get the ball rolling. The traditional topping in Ireland is a sprinkling of white sugar and a squeeze of lemon juice. Maple syrup is fantastic with pancakes, either on its own or atop melted cheese, such as cheddar or Monterey Jack, or with crispy, fried bacon. A spoonful of Nutella and some sliced banana makes a dessert-like treat. When we were kids my mother would serve savoury pancakes filled with chicken and mushroom in a cream sauce as our main meal before the sweet pancakes. This year I’ll be having sour cream and caviar, a Russian tradition that has travelled to Lithuania (though not specifically for Užgavėnės). I tried these while taking the photos for this post. The salty pop of the caviar coupled with the sourness of the cream and the crisp, hot pancake really does make for a marvellous mouthful. I’m going to try them I want minds to be crispy think you. Is 165g flour 3/4 cup? I don’t use cup measurements, but according to the site below, 165 g is 1⅓ cups. Hope that helps! I need to sent this to someone who likes reading recipes and wants to cook for me 🙂 I very much enjoyed the pictures though! You can do it, Linda! Just make sure the pan is nice and hot and you’ll be fine! Thanks! Do they not do something similar in Latvia? Will there be pancakes on Tuesday? I don’t know actually! I haven’t seen anything like what you described here! Wow! Great post! How fascinating! Thanks for sharing this cultural gem with us. Cheers! Very TASTY with the caviar! Lithuanians do not usually put caviar on their pancakes, especially on Uzgavenes. It is mainly a Russian tradition. Yikes! I’m not sure how I got this wrong! This was my first year being in Lithuania for Užgavėnės so I had no personal experience. However, I did read a million articles before I wrote the post. Reading back through them now I can only find one that mentions serving pancakes with caviar. That article was written by a member of the Lithuanian-American community, so it’s possible their traditions have both Lithuania and Russian influences. I’ve checked with a few friends and, while they do sometimes eat caviar with pancakes they agree that it’s not traditional for Užgavėnės. I’ve updated my post to take out the reference. Thanks a million for letting me know!